P34G v2 v2. 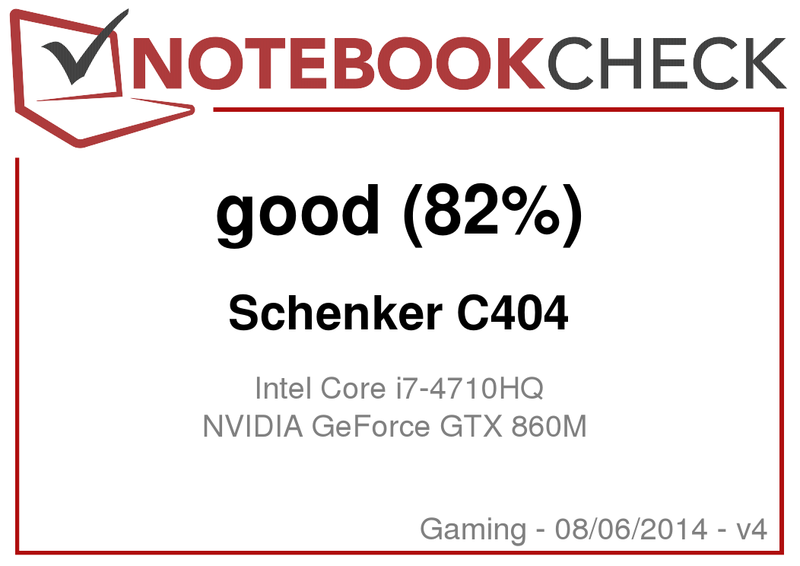 After we already reviewed the Gigabyte P34G v2 a couple of weeks ago, we now have a look at the similar Schenker C404 in this review update. Battery and build quality were drawbacks in the test of the original. Is the C404 better? A couple of weeks ago it finally happened: We reviewed the eagerly awaited Gigabyte P34G v2. It got a good rating, but there were some points of criticism. 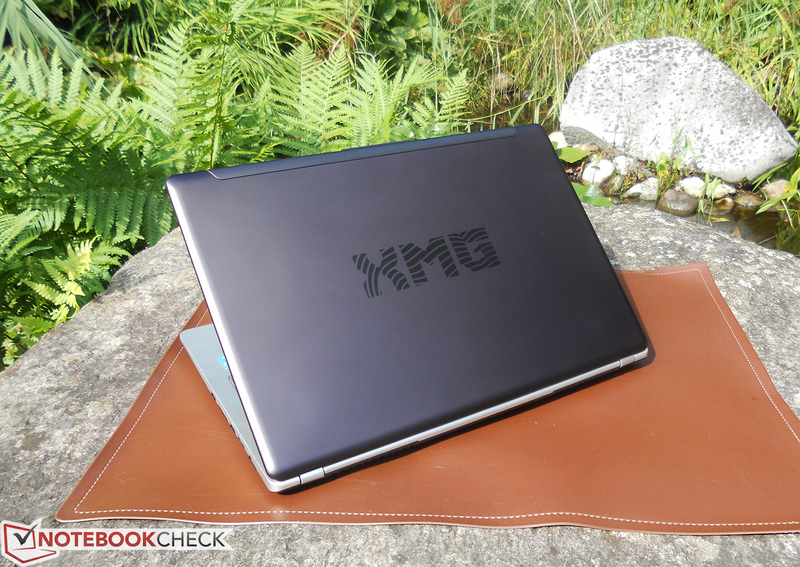 Even though this was a result of the pre-production sample, it is now time to put the thin aluminum laptop through our benchmark and measurement suite once again: The review update of the Schenker XMG C404. The notebook reseller Schenker Technologies is based in Leipzig, Germany, and it has an exclusive partnership with the Taiwanese electronics manufacturer Gigabyte, which means they are the only company that can sell the 14-inch gaming notebook P34G v2 with their own designation. 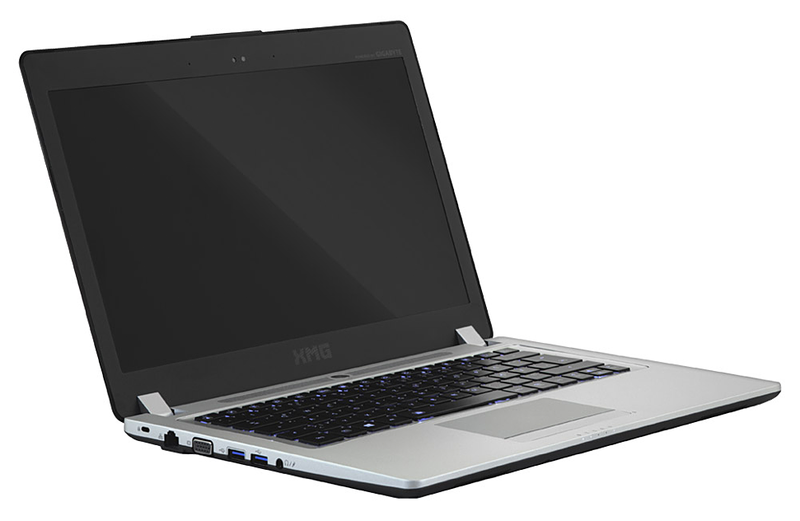 The 21 mm thin notebook is called XMG C404 and is, apart from the XMG logo, completely identical to the original. There are some small differences to our P34G v2 review sample in terms of features: The C404 has a bigger battery (61.25 Wh vs. 47.73 Wh) as well as the Haswell refresh (i7-4710HQ instead of 4700HQ). The storage solution in our C404 consists of a Crucial mSATA SSD (128 GB) in addition to a 500 GB Seagate Momentus HDD. The memory is provided by two 4 GB modules from Crucial and the graphics calculations are obviously handled by the Nvidia GeForce GTX 860M (Maxwell). We refer to our previous review of the identical sibling for the sections Connectivity as well as Input Devices and start our review update with one of the biggest criticisms of the P34G v2, the case. "Irregularities," "creaking sounds" and "protruding gaps" were the remarks of our colleague in regard to the issues with the build quality. We already mentioned that this was probably a result of the pre-production sample or maybe we got a defective device, but the case quality obviously wasn't very convincing. But the important question is: How does the C404 perform? Short answer: Better. Long answer: Our review unit does not show the build quality issues from the pre-production unit. The Schenker XMG C404 does show some uneven gaps at a closer look (keyboard mat, touchpad), but those are hardly serious build quality problems or flaws. Overall, the gaming notebook that is produced by Gigabyte leaves a solid and sophisticated impression, which is also true for the design with the silver aluminum case and the color accents from the anthracite-colored display cover and the black keyboard. Speaking of the keyboard: Flexing is only an issue with a lot of force, but not during typing. More information about the input devices is available in the review of the P34G v2. The stability of the chassis is decent when you consider the thin construction. It is a very similar situation for the thin display cover, which gets a good rating for the torsion resistance. The hinges are firm and keep the display well in position, but you can still open the lid with one hand. Concerned readers can be relieved: For 1417 Euros (~$1887), you get a solid notebook with a good – even though not outstanding – build quality, which meets the expectations for this price range in our opinion. It is not surprising that the Schenker C404 uses the same panel that we saw in the similar Gigabyte P34G v2. This also means the rating for the display is very similar as well. But first things first: The semi-matte Full HD panel with the designation B140HAN01.1 from the Taiwanese display manufacturer AU Optronics has 1920x1080 pixels and uses AHVA technology, which is the counterpart to the patented IPS technology from LG and is supposed to provide wide viewing angles. You get quickly used to the slightly grainy finish of the AUO display. It was no problem for the author, and the sharpness of the picture was not affected, either. 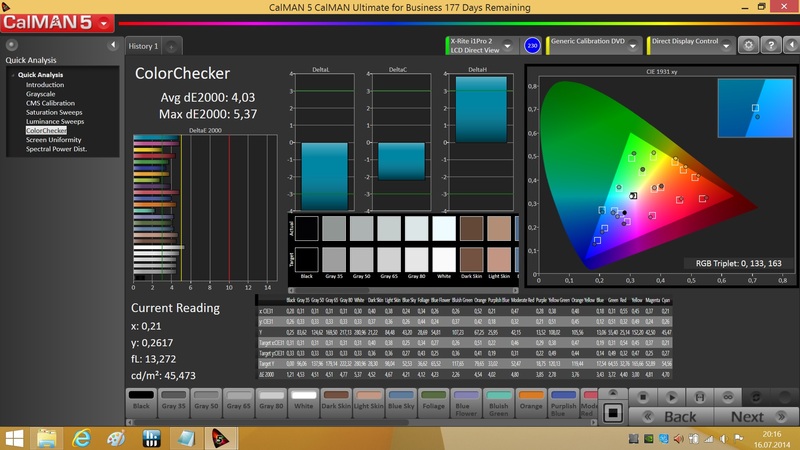 Similar to the P34G v2, the display luminance of the C404 is once again just average (the minimal difference compared to the P34G v2 is a result of production fluctuations). It is sufficient for indoor environments, but a brighter panel would not hurt outdoors. 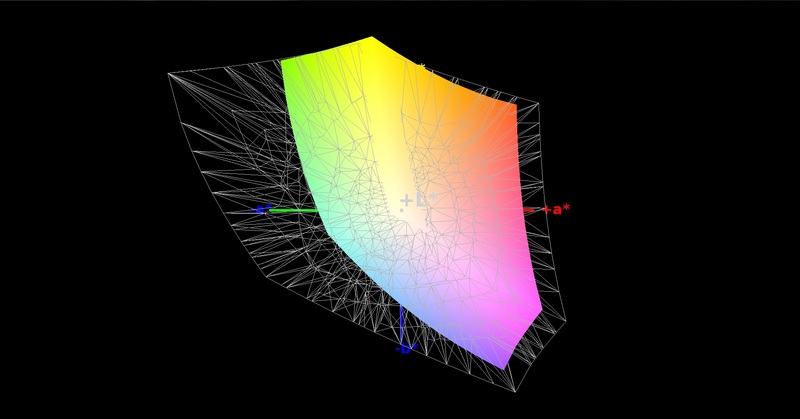 However, there is absolutely no criticism in terms of contrast and black value that are excellent with 1032:1 and 0.25 cd/m², respectively, and subjectively result in deep blacks and a high-contrast picture in general – sometimes it even looks slightly too saturated. 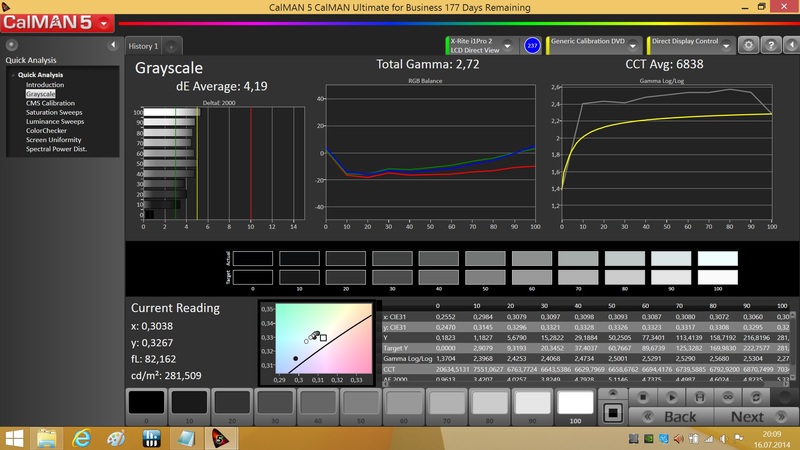 The color space coverage is on the expected, but not great, level with 79% sRGB and 58% AdobeRGB, respectively. Small drawback: The display suffers from some screen bleeding, but it is only visible with a completely dark picture and should not be a problem in practice. 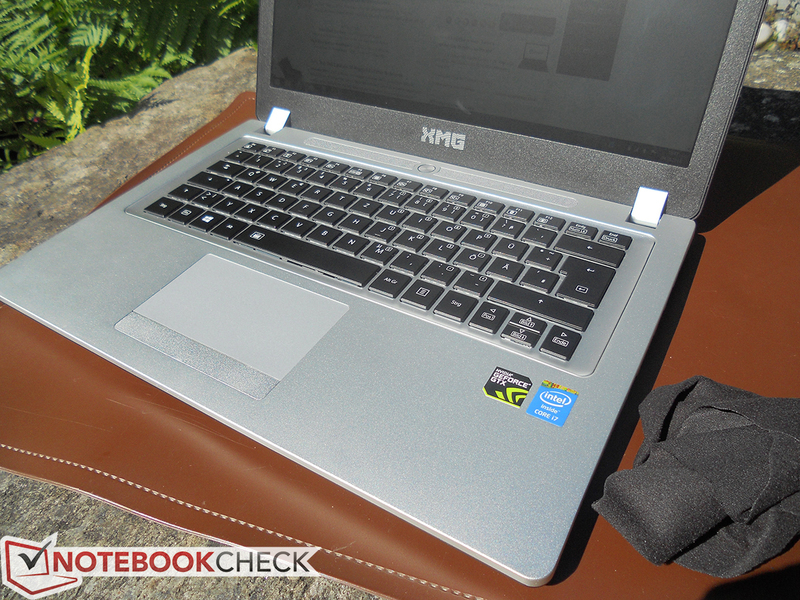 The outdoor usability of the 1.8 kg notebook is good, but not overwhelming. 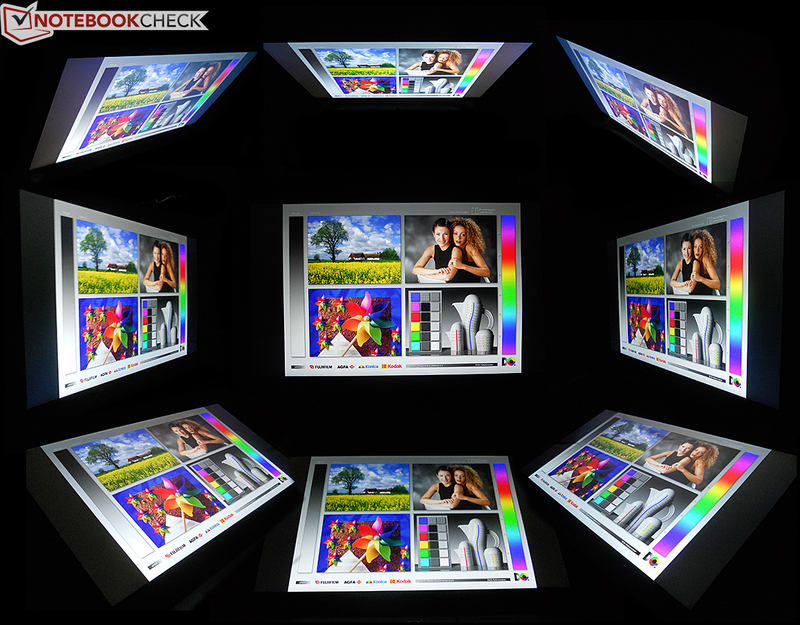 The matte display surface prevents annoying reflections that we know from glossy displays. However, the surface of the AUO panel is more semi-matte, so there can be slight reflections, especially with dark screen contents and bright environments, which can affect the readability. However, this only affects very dark contents and the problem is not serious, so you can still use it outdoors. The luminance is sufficient for good visibility in the shade, but you should avoid direct sunlight. The viewing angles, however, are no problem at all. Similar to the P34G v2, only viewing angles slanted from above have a small impact on the picture. Otherwise, it does not matter how you turn or twist the display: The presentation of the AUO B140HAN01.1 convinces with horizontal as well as vertical shifts. 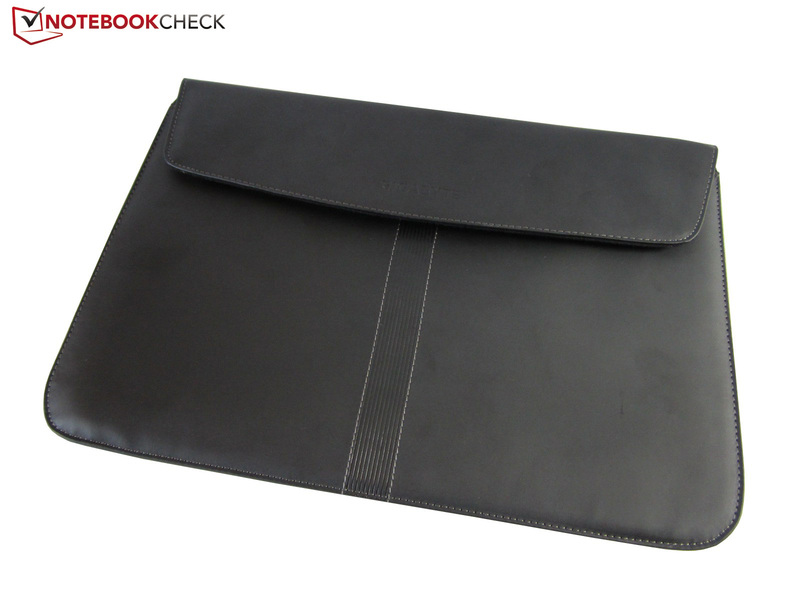 As many of our readers might know, the notebook reseller Schenker is well-known for the free configurability of its laptops. However, in the case of the C404 that is produced by Gigabyte, this configurability is limited to replaceable components like the storage, the memory or the WLAN module. Both the graphics card (Nvidia GeForce GTX 860M) as well as the processor (Intel Core i7-4710HQ) cannot be configured because they are soldered onto the motherboard. Our review sample uses, besides the mentioned CPU/GPU combination, a 128 GB Crucial M550 mSATA SSD, a 500 GB Seagate Momentus ST500 as well as 8 GB Crucial DDR3 memory in a dual-channel configuration. Haswell refresh! Sounds good, doesn't it? But Intel uses this phrase for updated components, when the computer giant cannot offer any new processors. 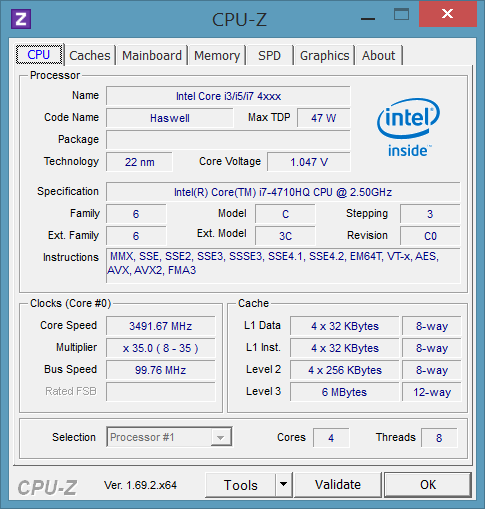 The current Haswell refresh Intel Core i7-4710HQ is just a 100 MHz higher-clocked version of the familiar bread-and-butter model 4700HQ. 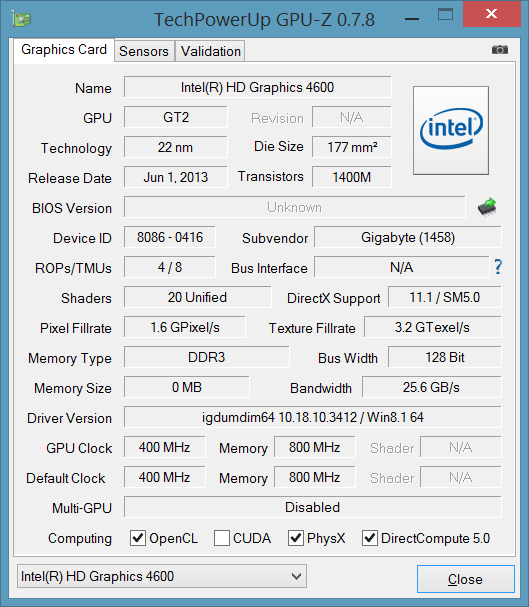 Intel still specifies the Thermal Design Power (TDP) with 47 Watts. However, this also means that the quad-core processor with 2.5 instead of 2.4 GHz (nominal clock) or up to 3.5 instead of 3.4 GHz (Turbo Boost), respectively, is still a very powerful entry-level CPU that is sufficient for all tasks. 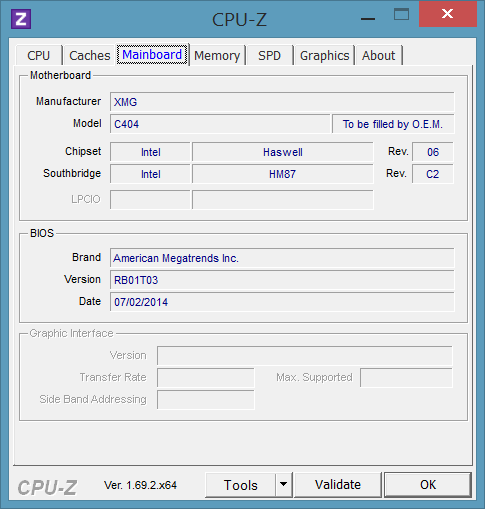 The designation "HQ" (contrary to the sibling 4710MQ) indicates that the CPU is soldered onto the motherboard and cannot be upgraded, which is usually possible with Clevo models (XMG A or P-series). 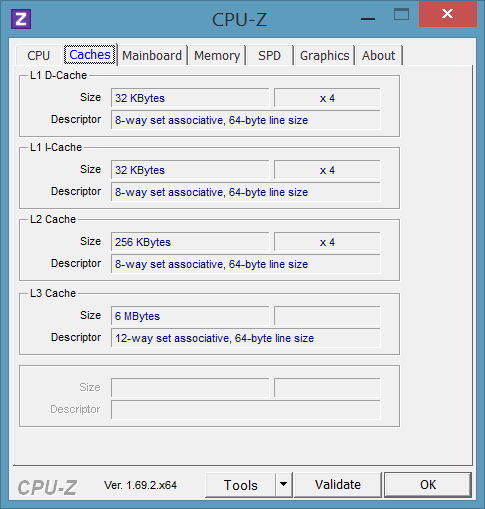 However, our Cinebench measurements show that this is not really necessary, because the faster CPU siblings only have a small performance advantage. It is therefore not surprising that the differences to the 4700HQ in our pre-production sample of the P34G v2 are just marginal as well. Apart from some measurement discrepancies, the results are pretty much on the same level. Users, unfortunately, cannot use the Turbo Boost on battery power (energy profile "High Performance"), but the processor does at least stay at its nominal clock of 2.5 GHz (single-core and multi-core). 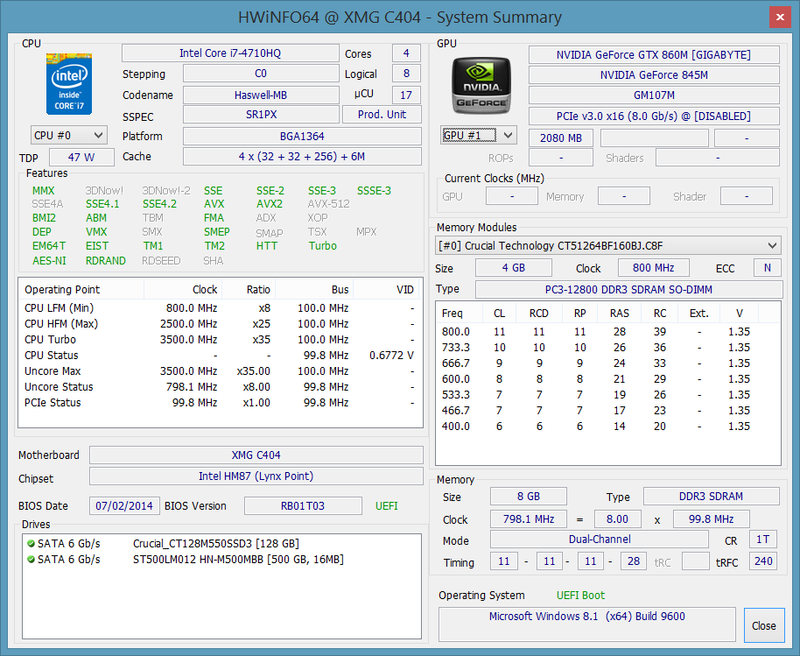 As expected, the system performance of the Schenker XMG C404 can completely convince us. The fast Crucial mSATA SSD M550 with a capacity of 128 GB is used as a system partition and not only provides fast application launches but also very fast boot times (cold start: 13 seconds, shut down in less than 10 seconds). The contemporary hardware equipment of the notebook with 8 GB memory (2x 4 GB) supports the good system performance, which even slightly surpasses the Gigabyte P34G v2 (Liteonit LMT-128M6M9, i7-4700HQ and 8 GB RAM) according to our measurements with PCMark 7 and PCMark 8. Data can be stored on two different drives in our review sample, the Seagate Momentus hard drive with 5,400 rpm and a capacity of 500 GB as well as the very fast Crucial M550 mSATA SSD with a capacity of 128 GB, which is used as a system partition. 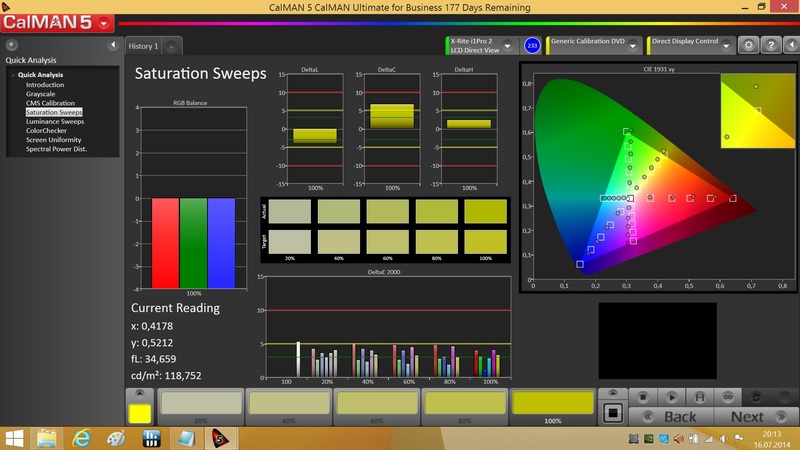 Both CrystalDiskMark as well as AS SSD determine a very high application performance for the system drive. 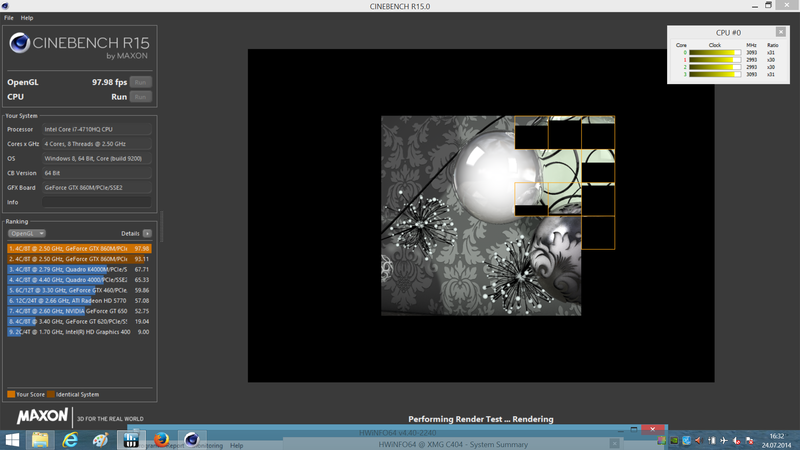 Similar to the P34G v2, the C404 obviously uses the Nvidia GeForce GTX 860M as well. The notebook GPU, which is one of the first chips based on the new Maxwell architecture, is a lower high-end chip and below the two Kepler models GTX 870M and GTX 880M in terms of performance. The 860M uses the Maxwell GM107 chip, which is, similar to the Kepler versions, still produced in 28 nm. Thanks to the improved power efficiency, 640 shader units as well as the much lower TDP are sufficient to perform on the level of the old high-end model GTX 770M. 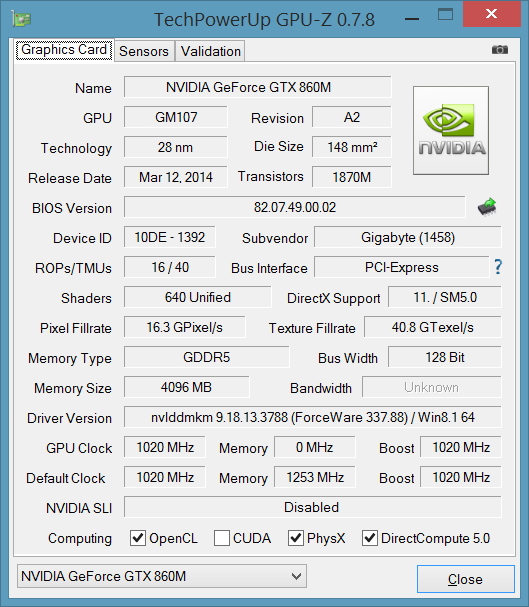 While tools like GPU-Z determine a clock rate of up to 1,020 MHz (GPU Boost), the graphics chip, which is soldered onto the motherboard, actually constantly runs with 1,097 MHz under load (except for the stress test, more on that later). Nvidia's Optimus technology ensures that the dedicated GPU is deactivated with simple tasks to improve the power consumption with the integrated Intel HD Graphics 4600. Sufficient gaming performance for Lara and Co.
Let's get to the natural habitat of the GTX 860M: Gaming. The GPU inside the Schenker XMG C404 can support our previous test results of the Nvidia chip: The entry-level high-end GPU is a powerful graphics card for current and demanding games. 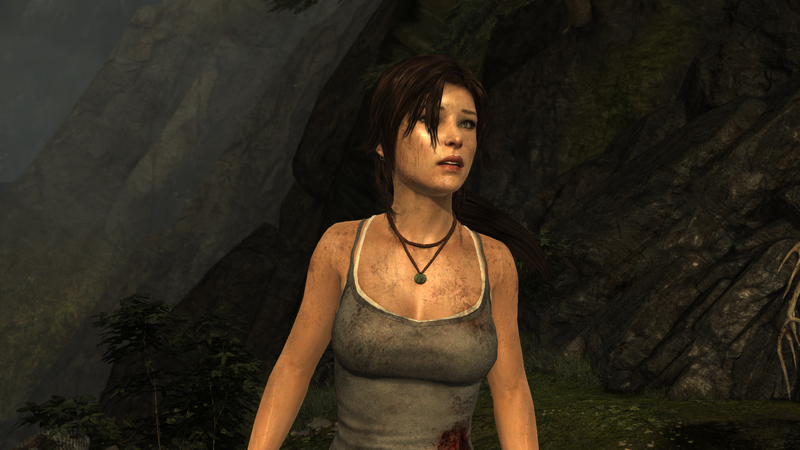 The native Full HD resolution, as well as high up to maximum details, is possible for most games. Only if you want to play very complex games, like Crysis 3 or Hitman: Absolution on the C404, will you have to reduce the settings to ensure smooth frame rates. However, the GPU is a good choice for these titles as well since they look pretty good with medium to high details. The system noise measurements can be copied from the old review since we cannot determine a difference in regard to the cooling solution. This would not be necessary during idle since the notebook is very restrained in this scenario and is even inaudible most of the time. The fan occasionally steps in, which is obviously clearly audible compared to the silence, but it is still very quiet at the first stage. Sometimes it reaches the second stage, which is more audible. 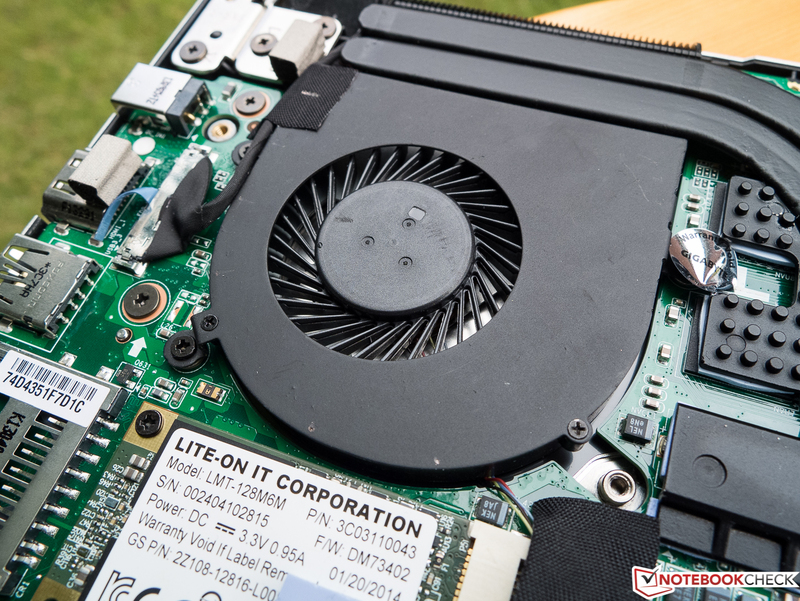 We therefore recommend the fan mode Stealth, which throttles the CPU clock to 1.2 GHz, for a library visit. This behavior changes dramatically under load: The maximum noise level of 50 dB(A) is very audible and could be annoying for gamers without a headset. The tester still found this noise level to be acceptable but very present. This should not be a problem for headset users. By the way: All our measurements were taken with the fan setting Auto (SmartManager). You can easily use this setting for load scenarios, because the Turbo mode basically just makes more noise: The constant maximum rpm level of the fan results in a slightly higher, yet clearly more audible noise compared to the Auto mode (~52-53 dB(A)). This might be too much for some users, especially since the hardware temperatures only drop by 1-2 °C, which is rather disappointing. We are not really happy with the temperatures of the Schenker XMG C404. The P34G v2 also reached pretty high values, but that cannot really be avoided with a device at this size and with these components. Still, we think that the temperatures of the hardware components inside the C404 are just too high. Multiple runs of the Unigine Valley benchmark resulted in GPU temperatures of up to 88 - 89 °C, and the CPU scratched the 90 °C mark as well. Even though these values are still within the specifications from the manufacturers, we can see that there is hardly any thermal headroom for warmer ambient temperatures (summer). The temperatures are also not perfect for the long-term reliability of the components. Our stress test confirmed the problems. The GPU also leveled off at 90 °C; the CPU reached 90 - 91 °C, even though the processor throttled heavily! 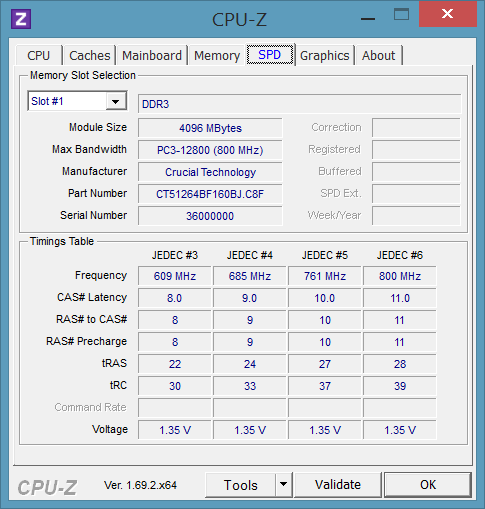 The graphics card was not able to maintain its maximum clock of 1,097 MHz, either, but it leveled off between 950 - 1,000 MHz, which is normal behavior. In this case, the temperature and throttling issues might be caused by a not perfectly working cooling system, not perfectly applied thermal compound or other problems. We already contacted Schenker and will verify our results in this section with another device shortly! (-) The maximum temperature on the upper side is 46.2 °C / 115 F, compared to the average of 39.3 °C / 103 F, ranging from 21.6 to 68.8 °C for the class Gaming. (±) In idle usage, the average temperature for the upper side is 34.2 °C / 94 F, compared to the device average of 32.9 °C / 91 F.
(+) The palmrests and touchpad are reaching skin temperature as a maximum (35.6 °C / 96.1 F) and are therefore not hot. (-) The average temperature of the palmrest area of similar devices was 28.7 °C / 83.7 F (-6.9 °C / -12.4 F). At this point we refer to the review of the Gigabyte P34G v2. In terms of power consumption, the Schenker XMG C404 uses significantly more power in all scenarios. We measure a minimum idle consumption of 13 Watts, which is on a level with the average consumption of the identical rival and around 50% higher than the measured 8.8 Watts of the P34G v2. The maximum consumption of the XMG model is higher as well with 26 Watts compared to the more frugal sibling with 21 Watts. The situation hardly changes under load: While the maximum value that the device can pull from the socket is identical for the two siblings with 141 Watts, the average consumption of the XMG C404 is once again clearly higher compared to the P34G v2 (97.7 Watts vs. 83.8 Watts). We were eager to see the new 61.25 Wh battery that Gigabyte uses for the current batch of the P34G v2, whereas Schenker always used this module for the XMG C404. We were pretty surprised by the results. Even though a runtime of 4 hours and almost 10 minutes for our WLAN test with an adjusted display brightness of 150 cd/m² is a decent result, it is still beaten by the four-and-a-half hours of the P34G v2 with a 47 Wh battery. It is a similar situation in the idle runtime test: Where the P34G v2 managed an excellent result of 7 hours and 46 minutes, the XMG C404 has to be recharged after around five-and-a-half hours. Our consumption results show that our review sample consumes much more power in almost every scenario compared to the P34G v2 review unit, so the differences in the battery runtimes are not that surprising. 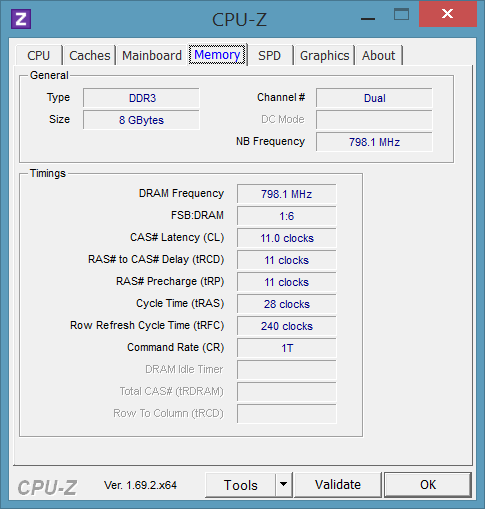 One reason might be the not (yet) completely optimized energy settings in the BIOS. 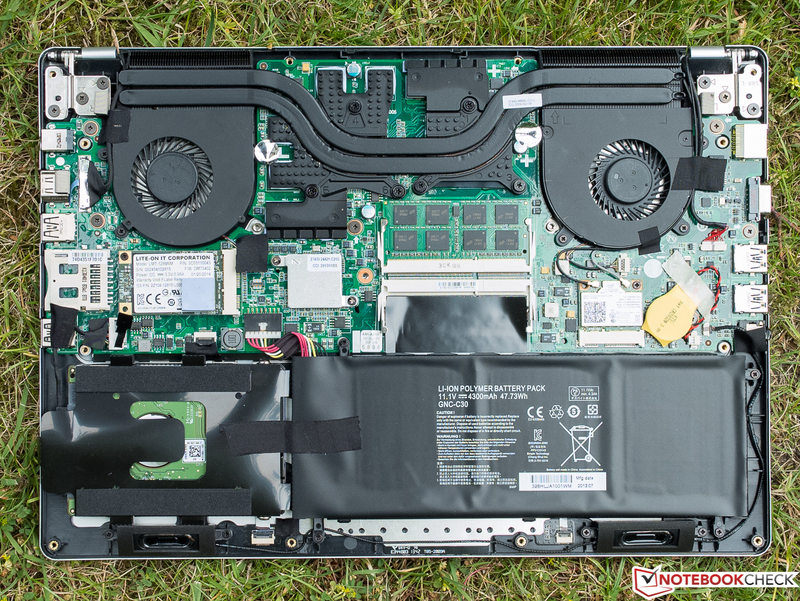 In our previous review of the similarly constructed Gigabyte P34G v2, we criticized the flawed build quality that prevented a better rating for the thin gaming notebook. This is not the case anymore for our latest review sample. Except for some small details, the case of the Schenker XMG C404 leaves a solid and good impression. The first-class AHVA panel convinces with very wide viewing angles, a matte surface that prevents reflections and great results for the contrast as well as the black value. Unfortunately, the slight screen bleeding affects the good impression, but it is only slightly visible with very dark content. The 21 mm thin 14-inch gaming notebook does not have to hide behind the competition with its powerful components. The GTX 860M as well as the Intel Core i7-4710HQ show how much performance is available in such a thin chassis, and the combination is powerful enough for demanding games. The fast Crucial M550 mSATA SSD ensures quick application launches and boot times. However, we are not really happy with the (hardware) temperatures, from the CPU and GPU in particular. 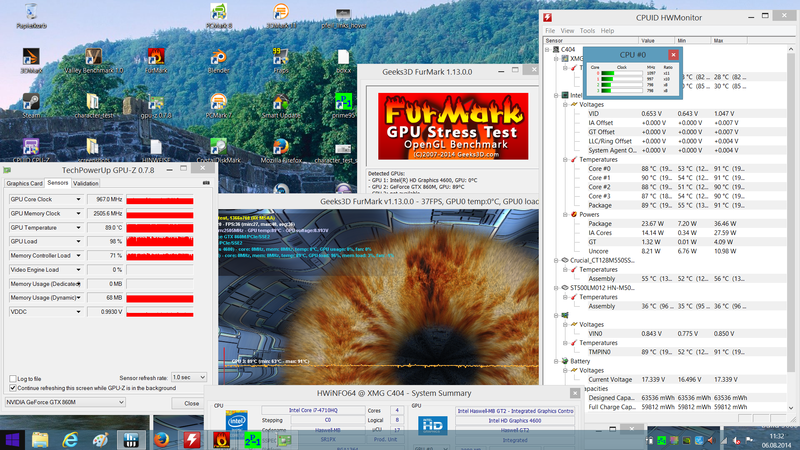 They are too high for our taste and the stress test also results in heavy throttling (CPU). The two fans are also pretty loud at the same time, which might be annoying for users without a headset. However, the notebook stays very quiet and sometimes even silent with light workloads. Overall, Schenker or Gigabyte, respectively, offer an attractive package that we can easily recommend for users that were hesitating because of the build quality issues in our previous review of the P34G v2. Potential buyers that don't want to waive the configuration options in terms of storage, memory or WLAN module can get the device from Schenker starting at 1269 Euros (~$1690). If you are, however, satisfied with the equipment from Gigabyte, we would recommend the Gigabyte P34G v2 in regard to the price. In review: Schenker XMG C404. Test model courtesy of Schenker Technologies. ...and from the left side. 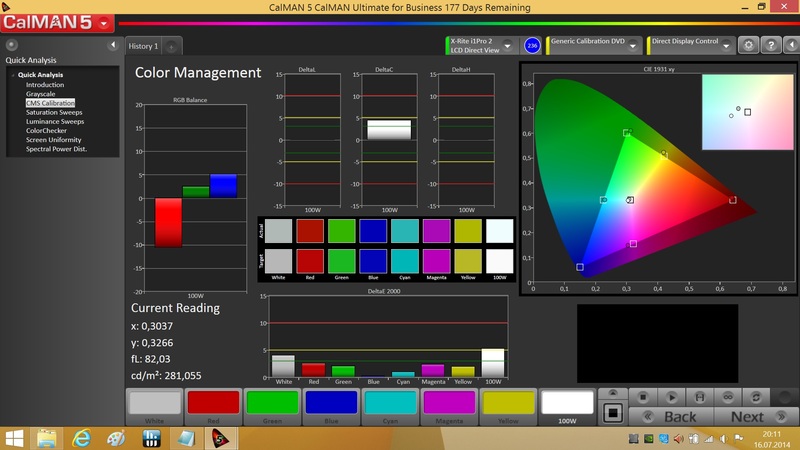 The outdoor capabilities benefit from the matte display. Still, you should avoid direct sunlight. The silver-colored aluminum base unit leaves a noble impression. ...in this case from the similar P34G v2. Schenker offers the Gigabyte P34G v2 with its own designation. Similar to the P34G v2, the Schenker C404 comes with a leatherette bag as well. The two fans are clearly audible under load, but pretty restrained during idle (picture from the P34G v2). The good build quality and the very good screen meet the price. We are not happy about the temperatures under load and the heavy CPU throttling in our stress test (small update soon!). The thin design and the low weight in combination with the high performance.